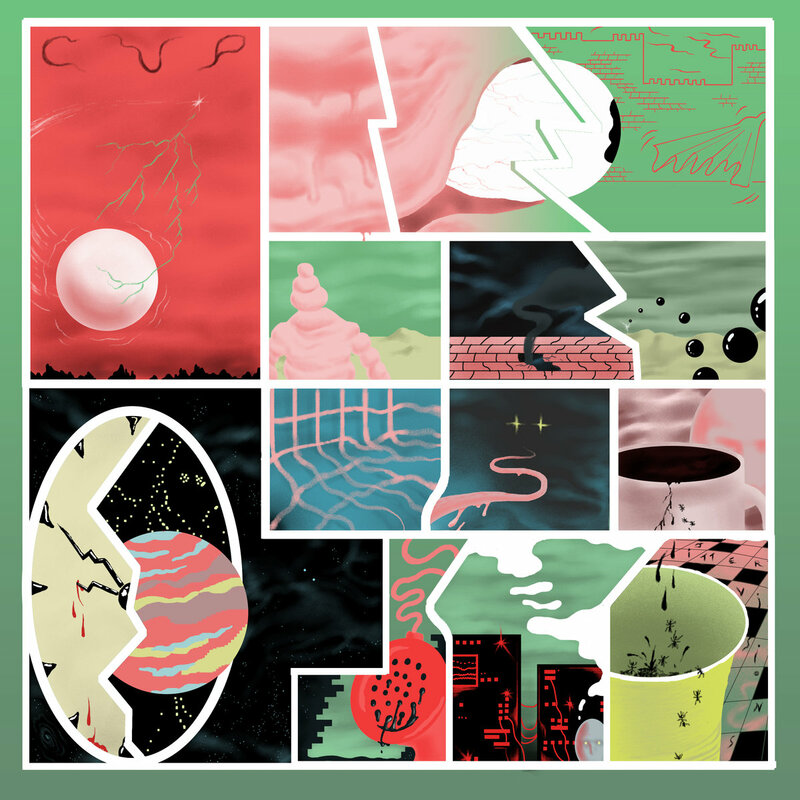 Unlike most psych albums, CUP’s Jitter Visions is a display in brevity. With only two tracks exceeding two minutes, this is an album that needs to be listened to as a whole. Cohesive in its style, it is difficult to differentiate one track from another. For the most part, Jitter Visions is musically retrospective. The band are easily conjured with beards and long hair, sweating in ill-advised tight t-shirts and flared velvet trousers. That they are actually a set of (predominantly) short-haired young men from New York who exist in the modern day is quite a surprise. CUP are heavier in sound than many psych bands. At times it is as if Ozzy Osbourne has entered the room. Tracks such as ‘Liquid Grid’ and ‘Runny Rummy’ have motor engine, grinding guitars and vocals that are almost spoken word. Many songs have aptly nonsensical lyrics that sound as if CUP have taken them straight from the rhyming dictionary. ‘Cosmic Brain’ is a list of such words, ‘elation…seduction…creation…abduction…deflation’. A randomness that will have you frantically making connections between them. What it does, at least, is provide a sense of unity against a backdrop of sound that sounds as if you are hurtling through outer space or someone else’s inner space. It is humorous and evocative. ‘It’s Calling For You’ is the longest track, approaching three minutes in length. It is the only track with a markedly different sound. Almost acoustic in places, this song demonstrates that there is some sweetness and a little nostalgia at the heart of CUP. There is even a tambourine. This bucolic idyll is vastly undercut by the vocal which deliberately distances by unnerving distortion and delivery. There is also a feeling that CUP are not as confident in producing sustained pieces as they might be. Mainly the differences between the tracks are the uses of sound effects. ‘Gum Boy’ has what appears to be a rocket launching in the middle of it whilst ‘Caffeinated Lover’ sounds more like bubbling flasks in a lab in a sixties’ sci-fi movie. ‘Eye See’ is the most classically psychedelic in sound with its loops and guitar effects. The ‘I see you in the grass lyrics’ are the embodiment of The Summer of Love. Considerably heavier, is ‘Time Attack!’ which has meatier, metal guitars and no colour. Jitter Visions is a piece of timelessness in its classic use of psych forms and sounds. It is comfortable in the referencing of its sixties and seventies influences both musically and its surreal animated presentation. It’s an enjoyable album just the same and will transport you to a gravity-less place for no longer than is necessary. Jitter Visions will be released on 27th April 2018 through Aagoo Records.